The Bookbinding Etsy Street Team is having a challenge to create a book for World Book Day. One of the things marked by this day is the anniversary of Shakespeare's death. So my book for this challenge is all about him. I intended to do something using a list of all his plays. So I visited Wikipedia, selected the complete list of plays that I wanted and attempted to "print selection..." but I fumbled and just sent the entire document to the printer. 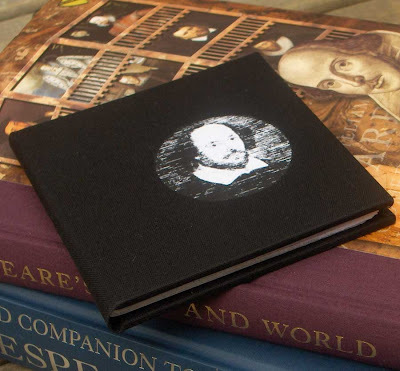 So, unintentionally having 22 pages of Shakespeare content in front of me, I changed my direction and made this little black book of Shakespeare Wiki Content. This is a small hardcover book, with black book cloth on the covers. I cut a circle in the cloth and put a photoshoped image of Shakespeare under the cloth peeking through. I used the ream of accidentally-printed paper to create the pages for this book. I cut them up to make a book that is 4¼" x 4¼" (11cm x 11cm). So all the pages have text and images printed on one side. After completing the black book, I still had some of the paper left, so I also made the three little notebooks shown here. The covers are heavy white cardstock, and they are sewn with black linen thread. 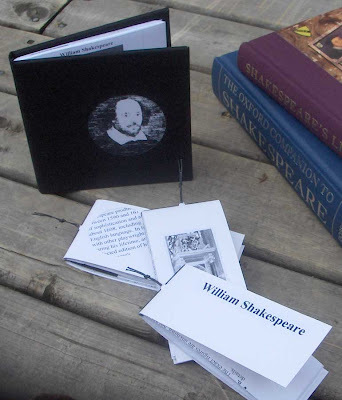 The covers are decorated with bits of text and images cut from some of the scrap page. World Book Day is April 23rd, so there will hopefully be other BEST members creating books for this challenge as well. They have been compiled with photos and descriptions on the BEST blog. Hi, I was wondering if you know of any online instructions on how to do a kettle chain stitch. I took a book binding class last year, and that was my favorite stitch and now I can't remember how to do it. Thanks.